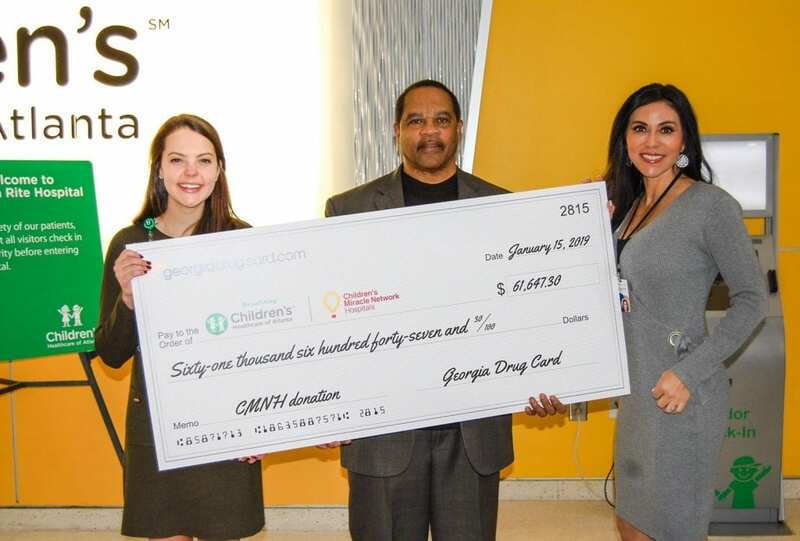 Georgia Drug Card presented a check for $61,647.30 on January 15, 2019 to Children’s Healthcare of Atlanta. This CMN Hospital offers access to over 2,600 pediatric physicians and practitioners representing more than 70 pediatric specialties and programs. Last year they served over 1 million patients. We are a proud partner of Children’s Healthcare of Atlanta. Our partnership helps create awareness for the Georgia Drug Card and helps raise money for the hospital at the same time. A donation will be made to Children’s Healthcare of Atlanta each time a prescription is processed using the Georgia Drug Card. We are excited to be a supporter of Children’s Healthcare of Atlanta and all the miracles they make. Since 2015, the United Networks of America partnership with Children’s Miracle Network Hospitals has raised over $2.4 million dollars for local children’s hospitals. Of this, $61,647.30 has been raised for Children’s Healthcare of Atlanta.